3 Tread Tilt and Go Step Welded steel tube and bar construction. Expamet treads and large working..
4 Tread Tilt and Go Step Welded steel tube and bar construction. Expamet treads and large working..
5 Tread Tilt and Go Step Welded steel tube and bar construction. 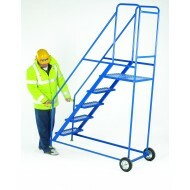 Expamet treads and large working..
6 Tread Tilt and Go Step Welded steel tube and bar construction. Expamet treads and large working..